David Letterman’s farewell show on NBC in the summer of 1993 had one sit down guest, Tom Hanks, who gave an incredible comical interview, perhaps highlighted by his digression on old Elvis movies, of which he’s a fan. He indicated that “Viva Las Vegas” had been his favorite Elvis movie until he saw “Roustabout”, which rocketed to the top spot, and which I found interesting because my two favorite Elvis movies would be exactly reversed. As it happens, both films were released in 1964, six months apart, and each one, in its own way, inhabits the disparate nature of his cinematic oeuvre. The former is emblematic of his sixties output, the travelogue films, as they are sometimes called, commissioned by producer Hal Wallis as fluffy movie star vehicles in exotic locales. And even if that’s all “Viva” is, it’s still his best movie star vehicle, with some great songs and set pieces and legit molten lava chemistry with Ann-Margret. The latter, on the other hand, was an attempt to re-create the rebellious spark of the Elvis movies from the 50’s. 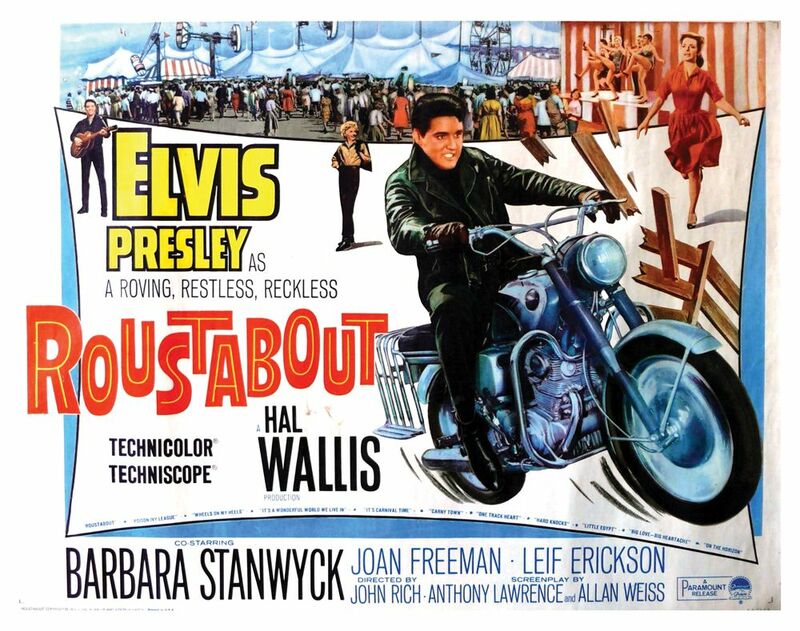 But whereas that spark in the 50’s was more a product of youthful swagger, in “Roustabout” it is brewed with anger. His character, Charlie Rogers, is written as an orphan, which has aroused the anger, which is conveyed in the opening scene where, making his living as a musical performer, he is confronted by a few bratty college kids representing the pretensions of polite society for which Charlie Rogers has no time. “I’ve seen more action in a zoo,” says one brat. “From which side of the cage, pal?” demands Charlie, which is one of the all-time Elvis movie comebacks. This leads to a brawl which lands Charlie in jail before he gets sprung by a waitress at the club where he plays, though if she thinks this’ll curry favor, she’s wrong. “Just because you bailed me out doesn’t mean you own me,” he intones, a shot that was probably aimed at Wallis and Colonel Tom Parker more than the actual character. The same thing more or less takes place not long after, when Charlie rides his motorcycle up alongside jeep on the highway to flirt with the pretty young girl, Cathy (Joan Freeman), in back. Her father, Joe (Leif Erickson), doesn’t take kindly to this Elvis-ish ingrate and runs him off the road, damaging his ride and his guitar. Ye gods. But Joe’s wife Maggie (Barbara Stanwyck) intervenes, promising to pay for repairs, and when Charlie agrees, he finds himself whisked away into their world, one of a traveling carnival...a struggling traveling carnival, that is, which Elvis helps rescue from the financial doldrums, as he must, with a little rock ‘n’ roll. This plot, like most every Elvis movie plot ever, really doesn’t inspire. Charlie’s sour dynamic with Joe never finds a genuine charge and his romance with Cathy never really ignites, not that it matters. Emotionally, it’s less about Freeman than Stanwyck, who convincingly emits a care for this young rebel in her charge, even as the two bicker. Elvis, obviously, was nowhere near the actor that Stanwyck was, but when he was actually cast opposite an actor, someone who could really throw down, Elvis would throw down too, and it would benefit him immensely, as it does here. He’s engaged, and because he is, he entertains. It’s an entertainment with an edge, though, one that never really dissipates, even if you keep expecting it to, like these old carnival vanguards will get him to shape up. Elvis often shaped up in his movies, like in “Blue Hawaii”, which I might love but nonetheless gets tripped up when it tries to make Elvis into a moralizing adult. 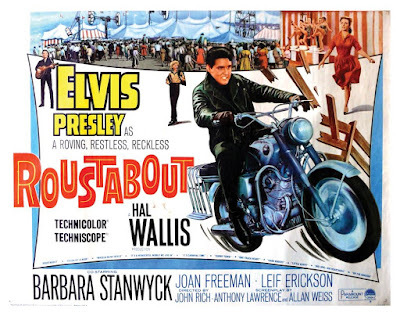 In “Roustabout”, he never softens, not even in the service of the obligatory happy ending, an emotionally static character if there ever was one, and thank goodness. In real life, Elvis didn’t quite go down swinging, of course, but at least here he was still good for a few punches.